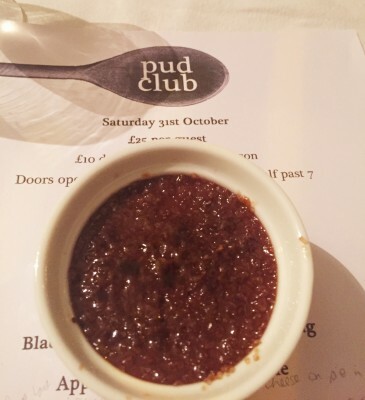 If the first rule of Pud Club is to tell as many people as possible about Pud Club, then by writing this blog post I am definitely playing by the rules. 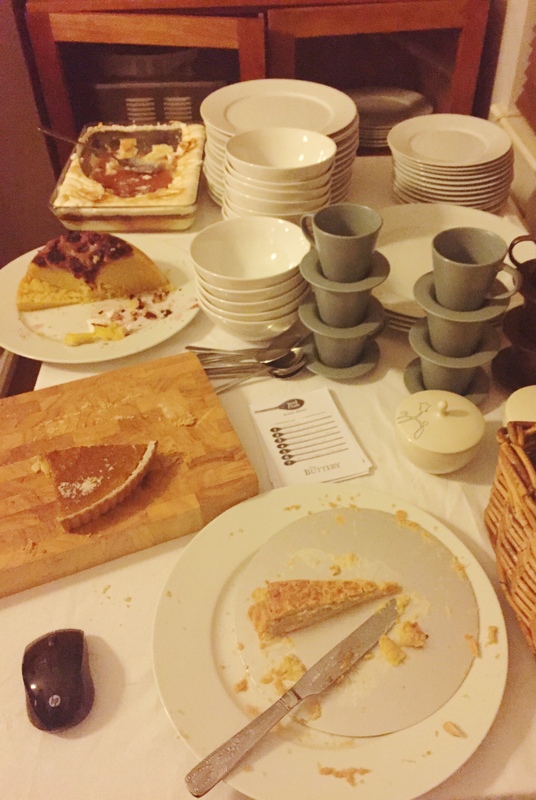 On Saturday, instead of donning scary masks and heading out trick or treating, four of us headed to a terraced house in Levenshulme to over indulge in seven courses of pudding. 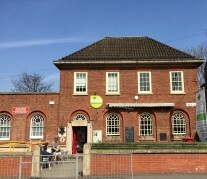 It may seem an unlikely destination for a supper club but Neil Buttery, known for his involvement in Levy Market where he has a regular stall, hosts frequent pop up events from his own front room. The man behind The Buttery (with a name like that you are destined to become a chef) goes to great lengths to source the best local and seasonal ingredients to create his dishes; a celebration of real British food. 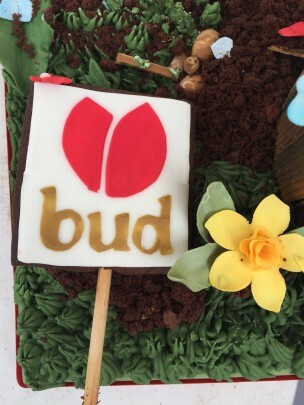 To make the most of Pud Club, eat something savoury for lunch, salad would probably do. Avoid sugar at all costs so you can truly make the most of your evening. I’d recommend going equipped with your favourite wine (dessert wine works well! ), a huge appetite, and accommodating clothes. There’s no skimping on portion sizes here; asking for seconds is actively encouraged, and you can even take the leftovers home in a doggy box. 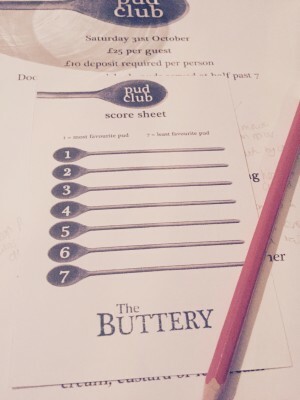 There were no secrets about the menu, which featured every kind of pudding you could imagine, and some you probably couldn’t. 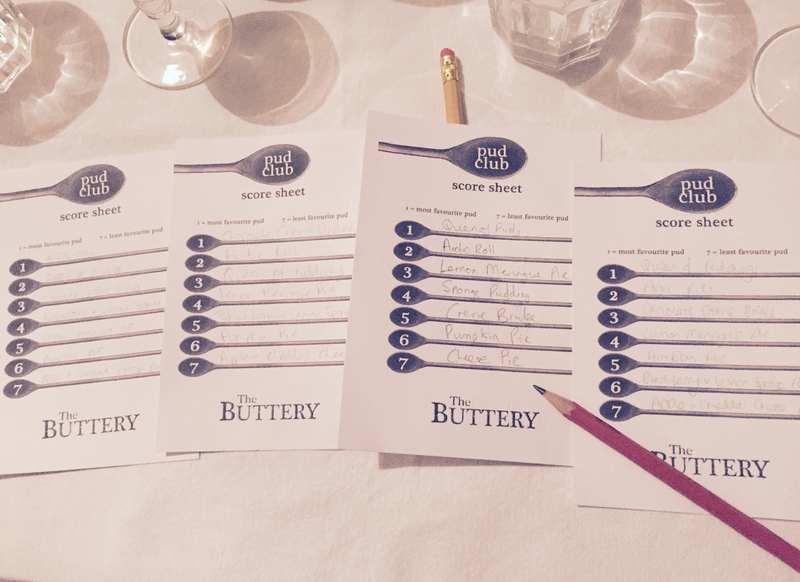 Our mission was to enjoy the seven puddings then rate them to collectively decide a winner. 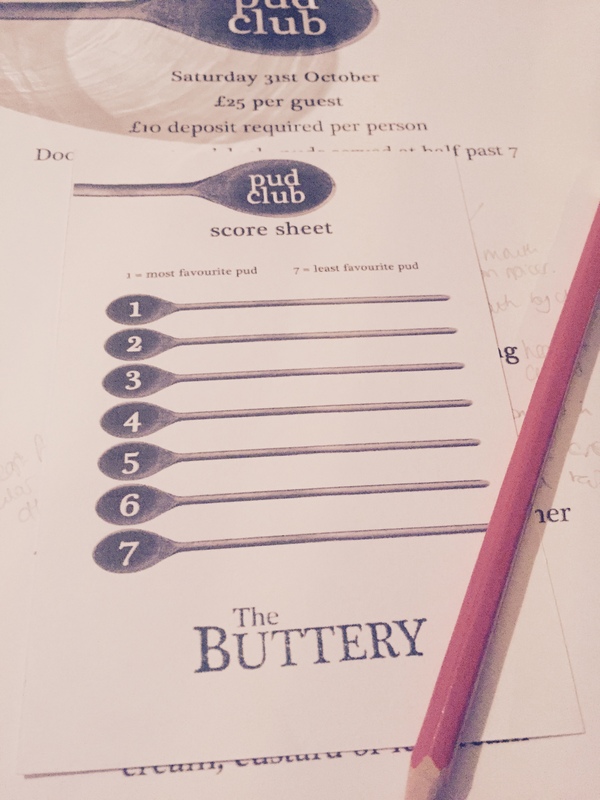 The best pudding would be carried forward to the next Pud Club. We adopted a ranking system which involved writing the first course in the middle of the page then placing each subsequent course higher or lower than the last. It turned out to be an effective way of making sure each pudding was properly accounted for. Proceedings got under way with the Lemon Meringue Pie. Light, sweet, and deliciously tart, with a crumbly base. It was a clever choice to start, leaving plenty of room for what followed. 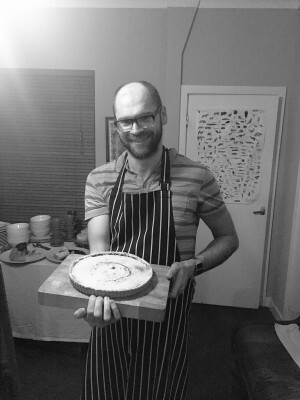 Second was the Arctic Roll, or more specifically, a handmade, Bakewell tart inspired arctic roll. In order to avoid frozen sponge, the dish had to be assembled on the night, bringing with it a tantalising risk of calamity that involved releasing the almond ice cream from a pipe. If Neil was cursing in the kitchen he managed to do it quietly, but admitted he didn’t want this to win. 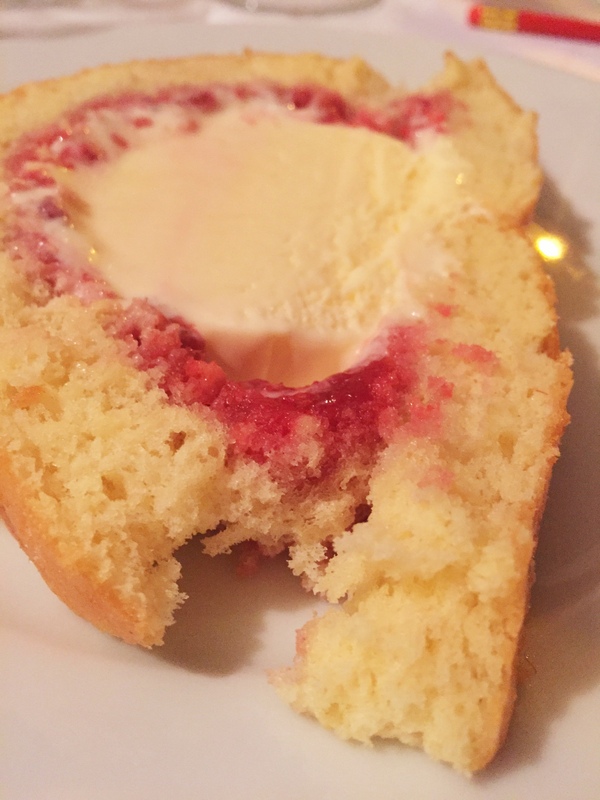 Once freed, the ice cream was wrapped in a jacket of light and airy sponge, spread with home made raspberry jam. 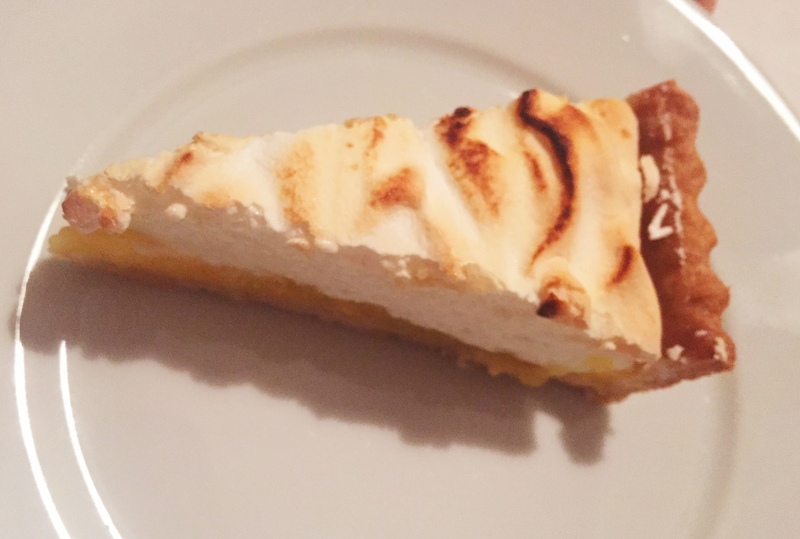 This amazing take on a well known dessert went straight to the top of my list – sorry not sorry! 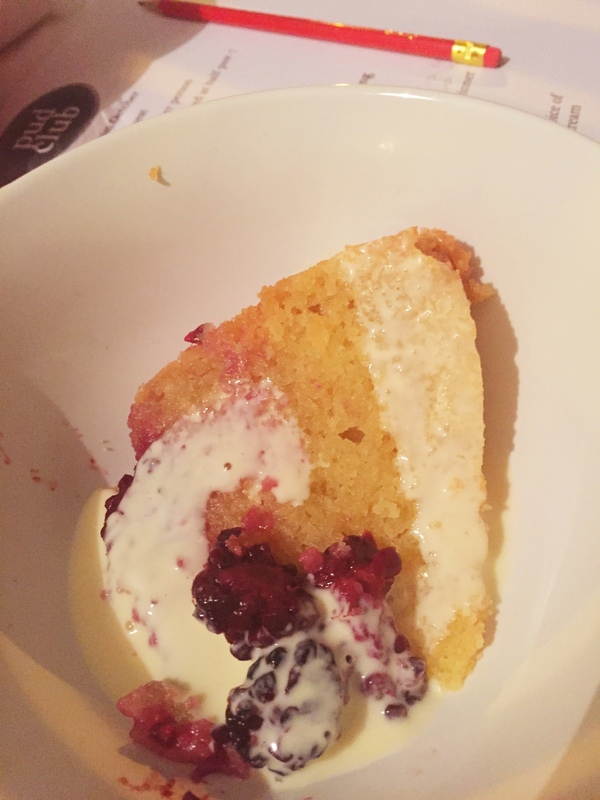 The arctic roll was followed by Blackberry and Lemon Sponge Pudding. Served with an optional drizzle of custard, it was the most hearty pudding, although much lighter than I expected. I struggled to squeeze it in and started to question whether I was capable of making it through four more courses. Next up was the controversial Apple and Cheddar Cheese Pie. 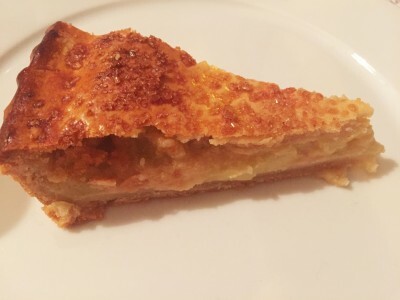 Apparently it was an old Yorkshire tradition to add a cheese topping to apple pie. In this version the cheese was integrated in to the filling – a “cheesoning” as Neil called it. A slightly cheesy sauce oozed out from amongst the apples. After the first bite I was not a fan, but I persevered and the flavour grew on me. Not enough to elevate it above the other puddings for the four of us, but it divided opinion and topped the list for some guests. In contrast to apples and cheese, course number five was the Chocolate Crème Brûlée. A little pot of rich, chocolatey goodness with the obligatory caramelised shell – delightful. It scored highly but going in to course six, arctic roll was still top of my list. By the time the Pumpkin Pie arrived I was in a pudding coma. Luckily the portion sizes were reducing and I was determined to keep going. 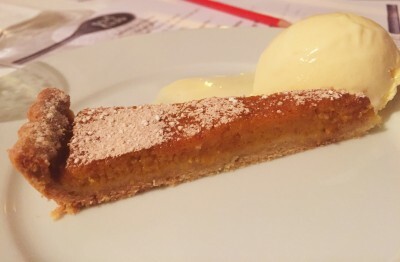 This was a gently spiced, melt in the mouth, halloween treat, with flavours of autumn. The previous winner, Queen of Puddings was the finale. 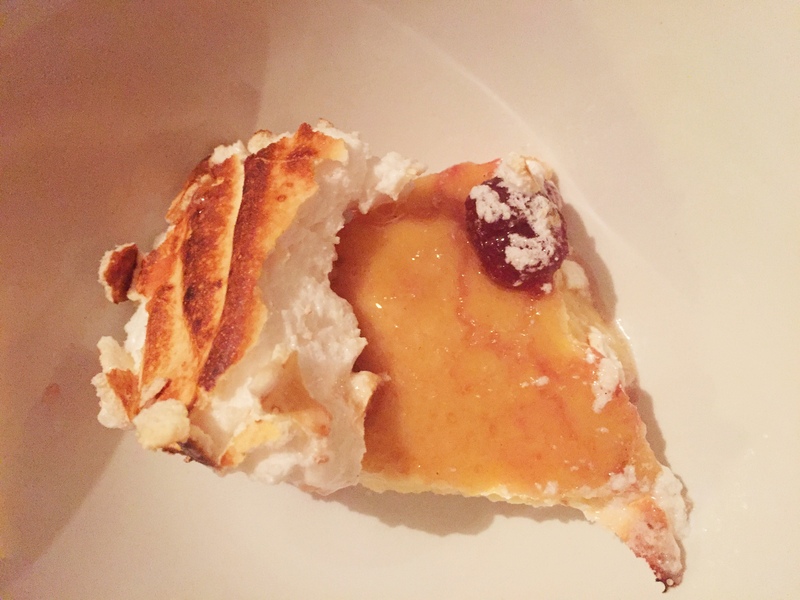 Layers of fruit, bread, custard and meringue. It’s hard to describe how it tasted but it squeezed the arctic roll off my number one spot as I squeezed in every last morsel. 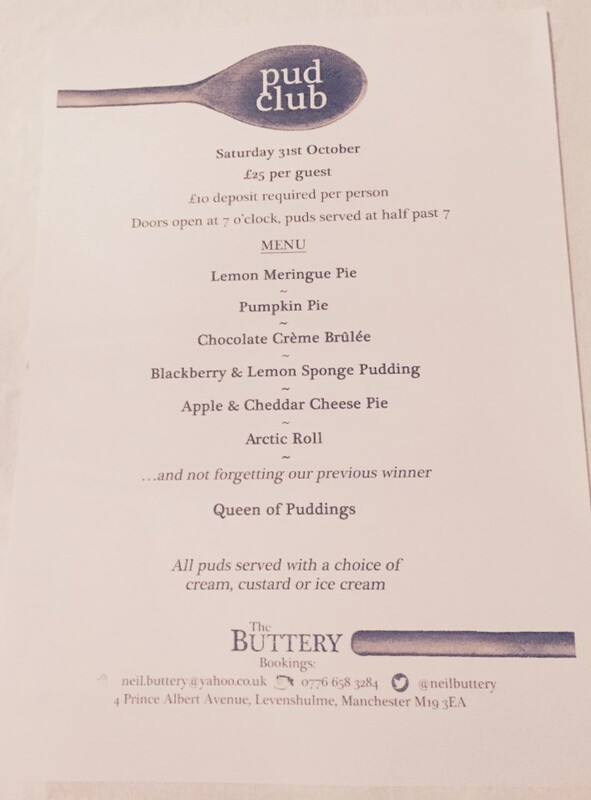 Queen of Puddings came out on top and will find its way on to the menu at Pud Club at least one more time. Neil Buttery won’t have to worry about extracting ice cream from a pipe again any time soon. 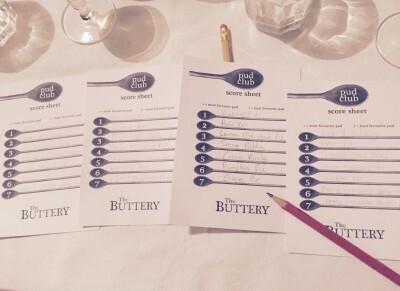 Full details about upcoming Pud Clubs, and other pop up supper clubs from The Buttery, can be found on the website. Book quickly because, with space at a premium, you might have to fight me for a chair. 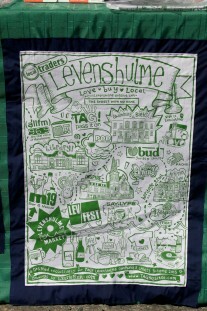 You can also buy wonderful food from The Buttery at Levenshulme and Chorlton Markets.